On this day of cornbread stuffing and tryptophan delirium (Tim Lambesis should start a Thanksgiving-themed joke band with that name), I thought it prudent to give a shout-out to an album for which I am very thankful this year. Too often I get caught stuck in compartmentalization mode when I review albums, attaching genre descriptors or comparisons for the sake of brevity. It's not that the debut from Struck By Lightning sounds like nothing else -- there's a lot of early Mastodon in the guitar filigree and harmonic motion, plenty of chuffing High on Fire rhythms, and a lot of airtight d-beat punk breaks. That particular combo is pretty unique, but what comes across to this jaded reviewer even more than Struck By Lightning's influence-on-sleeve approach is their transcendent songwriting. Unlike vocalist/guitarist Gregory Lahm's other band, Mouth of the Architect (reviewed here), Struck By Lightning lets nothing get in the way of momentum. The intro to opener to "Silent and Still" portends great things, and boy, does it deliver. A galloping verse riff pushes through to a tension-building pre-chorus which bursts into a ragged, wailing chorus that I want to play again RIGHT NOW. Travis Klein's loose-tom, tumbling drum fills power the "Nothing Sacred" riff juggernaut, heavy and propulsive as anything off Surrounded By Thieves. In the line "Smiling vultures slowly circling," the opening line from "The Watchful Eye," Struck By Lightning have their own version of Mastodon's classic "I think that someone is trying to kill me." The comparison holds up throughout the rest of the song too, making for one of the punchiest one-two-three punches I've ever heard. As Serpents wears on, the shock of such a fully-formed sound of composite elements wears off, and it's only then that this album really reveals itself. Beyond the perfect execution and terrific songwriting, there's a malevolence that underlies Serpents. You can hear it in the sudden switches between diatonic and chromatic intervals. You can hear it in Struck by Lightning's bottom end, which slithers around in the murk like the album's titular beasts. Mastodon rode that same foreboding musical path to fame. 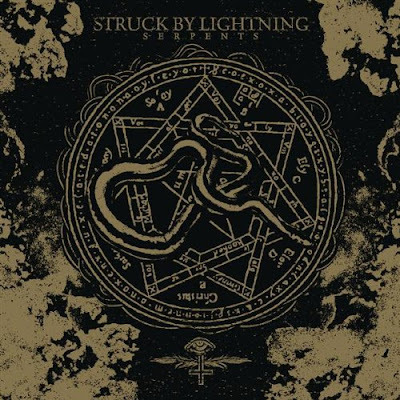 Struck by Lightning are probably a little too punk to ride the dragon that far, but at least they can say they put out one of the year's best albums, and probably the best album that Translation Loss has ever released. Thanks for that. Wow, great sample tracks there! I can imagine that Mastodon could have made this to follow up Remission, in a parallel universe.